Height 2414 feet. / 735 metres. 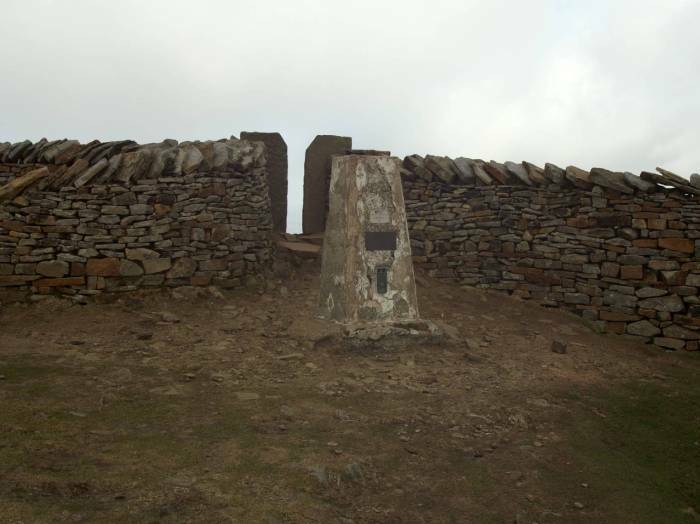 Grid Reference SD 738 814. Horton in Ribblesdale - Brackenbottom - Brackenbottom Scar - Pen-y-ghent - Whitbar Hill - Sell Gill Hill - Red Moss Pot - High Pasture - Birkwith Cave - Gods Bridge - Nether Lodge - Ingman Lodge - B6479 - Ribblehead - Bleamoor Sidings - Blue Clay Ridge - Little Dale - Slack Hill - Force Gill Ridge - Grain Ings - Whernside - High Pike - Bruntscar - Philpin - B6255 - Hill Inn - Philpin Slights - Southerscales- Braithwaite Wife Hole - Humphrey Bottom - The Arks - Swine Tail - Ingleborough - Swine Tail - Simon Fell Breast - Sulber - Sulber Nick - Horton in Ribblesdale. 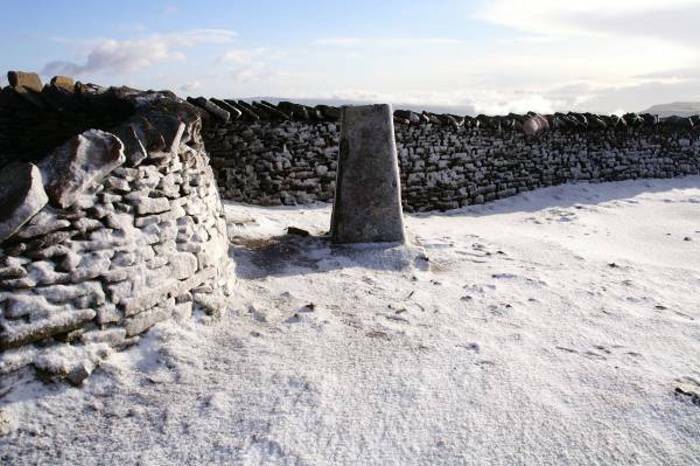 The Occupation Road, Whernside and the Craven Way. 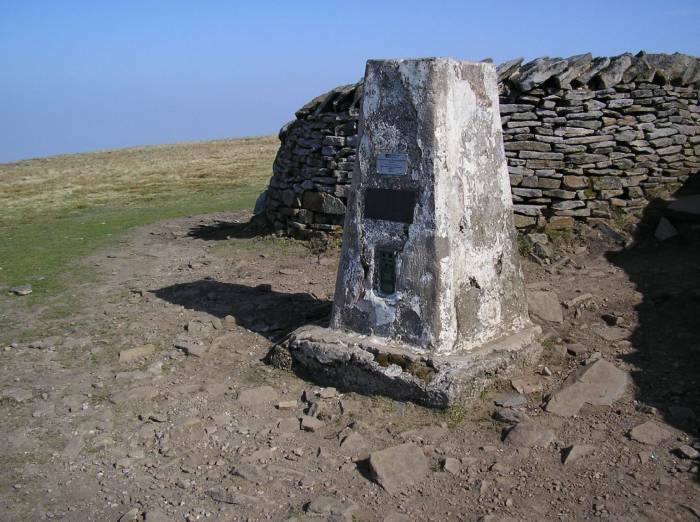 Dent - Flinter Gill - High Ground - Occupation Road - Foul Moss - High Moss - Kingsdale - White Shaw Moss - Cable Rake Moss - Whernside - Cable Rake Top - Knoutberry Hill - Whernside Tarns - Craven Way - Boot of the Wold - Wold End - Dyke Hall Lane - Mill Bridge - Dales Way - Church Bridge - Dent. Whernside and the Craven Wold. Ribblehead - Bleamoor Sidings - Blue Clay Ridge - Force Gill - Grain Ings - Cable Rake Top - Whernside - Cable Rake Top - Knoutberry Hill - Whernside Tarns - Boot of the Wold - Craven Way - Duncan Sike - Craven Wold - Force Gill Ridge - Little Dale - Blue Clay Ridge - Bleamoor Sidings - Ribblehead. Ribblehead - Ribblehead Viaduct - Gunnerfleet Farm - Lockdiddy Hill - Ivescar - Broadrake - Low Pike - High Pike - Whernside - Cable Rake Top - Grain Ings - Slack Hill - Force Gill - Little Dale - Blue Clay Ridge - Ribblehead. Ribblehead - Batty Green - Ribblehead Viaduct - Gunnerfleet Farm - Lockdiddy Hill - Ivescar - Broadrake - High Pike - Whernside - Knoutberry Hill - Grain Ings - Slack Hill - Little Dale - Force Gill - Force Gill Aqueduct - Bleamoor Sidings - Ribblehead Viaduct - Batty Green - Ribblehead. Dent - Flinter Gill - Occupation Road - Kingsdale - Cable Rake Moss - Whernside - Knoutberry Hill - Whernside Tarns - Craven Way - Dyke Hall Lane - Mill Bridge - Dales Way - Church Bridge - Dent. 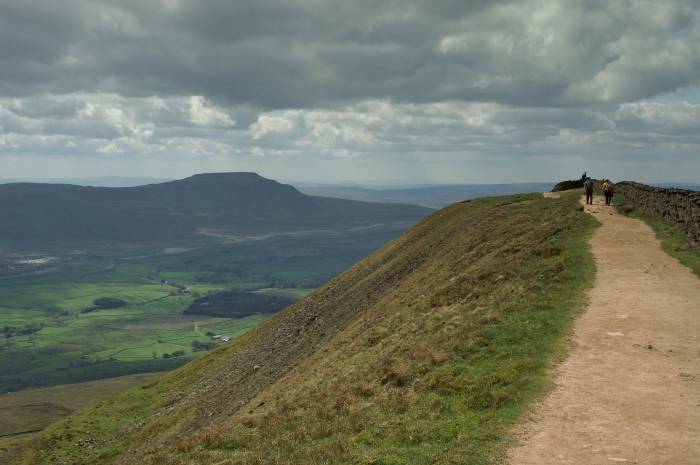 Ribblehead - Gunnerfleet Farm - Lockdiddy Hill - Inverscar - Broadrake - High Pike - Whernside - Grain Head - Slack Hill - Force Gill Aquaduct - Bleamoor Sidings - Ribblehead. Ribblehead - Bleamoor Sidings - Aqueduct - Grain Ings - Cable Rake Top - Whernside - High Pike - Broadrake - Ivescar - Lockdiddy Hill - Gunnerfleet Farm - Ribblehead. Whernside from Dent return through Deepdale. Dent - Church Bridge - Dales Way - Mill Bridge - Dyke Hall Lane - Craven Way - Whernside Tarns - Knoutberry Hill - Whernside - White Shaw - Deepdale Head - Mire Garth - Dyke Hall Lane - Mill Bridge - Dales Way - Church Bridge - Dent.